There are various trench coats in our collection that has special associations but appearance wise they are the same. But his coat has the unique style of looking as it has been designed to copy the Nazi Officer from the TV Series Man in the High Castle as Rufus Sewell wore it. Many wants to replicate the John Smith character and become the Nazi officer for the experiment. You can easily wear this coat to the different events and social gatherings to show your interest with some considerable precautions. 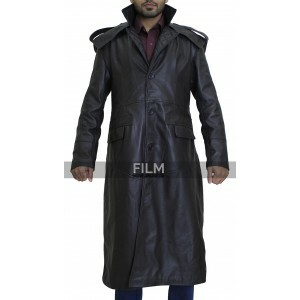 This coat is very durable and comfortable to wear. I bought this Rufus Sewell coat to try this Nazi outfit for a change and to be honest I really liked the material and the stitching. The leather seems to be very durable. "Its knee length and long sleeves assure complete warmth during winters. You are even not required to wear anything under it because it serves as the c"
"This jacket is full of desire and passion. I can feel the presence of a guitarist after putting this jacket on. I am using this jacket for a while and"